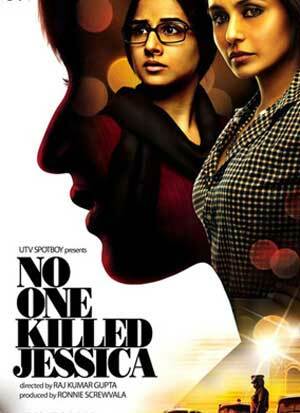 New Delhi, Jan 3 (IANS) "No One Killed Jessica" is the first release of the year. It's inspired by the high-profile murder of model Jessica Lall, a crime that rocked the nation 11 years ago. Filmmaker Rajkumar Gupta brings the tragic story on celluloid in his second directorial venture that is releasing Friday. Produced by UTV Spotboy, the film features Vidya Balan as Jesscia's sister Sabrina while Rani Mukerji plays a journalist named Meera Gaiety who feels passionately about the case. The story will encapsulate incidents related to the murder and Sabrina and Meera's relentless struggle in their pursuit for justice for Jessica. The film also stars Randeep Hooda. Jessica, a model who also worked as a bartender, was shot dead April 29, 1999, by Manu Sharma, son of former union minister Venod Sharma, after she refused to serve him a drink at a party organised at designer-socialite Bina Ramani's night bar Tamarind Court in the capital. However, due to lack of evidence the nine accused were acuqitted by the trial court in February 2006. In March 2006, Delhi Police filed appeal in the high court and in December Manu, Vikas Yadav and Amardeep were convicted. In April 2010, the Supreme Court upheld the conviction and life term of Manu. For 11 years Sabrina stood her ground and fought for justice for her sister despite many personal and other problems. She never gave up. Gupta clarified the film is neither a biography of any person nor a documentary. It is his "own interpretation" of the case, but it is not "judgemental". He describes it as a mix of fact and fiction. In fact, he sat with Sabrina for hours to get the facts right and she feels that the director has done justice with the film and handled the subject sensitively. In the film, Rani will be seen in a rather bold avatar, where she smokes cigarettes and hurls abuses left, right and centre. Another area of discomfort for the film was the legal ramifications of showing real-life people, particularly the hostile witnesses in the murder case. In fact, former cop Amod Kanth, who was joint commissioner of police (southern range) at the time the ramp model was shot dead, wrote a letter to the censor board urging it to ensure all the facts are presented correctly. In the promos they had beeped out all the expletives used by Rani. The censor board awarded an A-certificate to "No One Killed Jessica" without any cuts and its makers hailed the decision saying they were happy to be able to take the story to the audience. Gupta proved his mettle with "Aamir" where he teamed up with small screen star Rajiv Khandelwal and both the director and the actor wowed critics and audiences alike with the thriller that had terrorism as its main plot. Though the film has got an A certificate, chances are that it will lure audiences as it is based on one of the most talked about murder cases in the country and there will be many who would be curious to know exactly what happened on the fatal night and how Sabrina finally managed to get justice.